identify multiple removable disks by its label. Thank for a great tool. Currently, everything does not distinguish multiple removable hdds when attached via a hdd dock. And I'd like to see the label of removable HDD. Is there any easy way to manage/identify multiple removable hdds using hdd labels or hdd serial numbers? 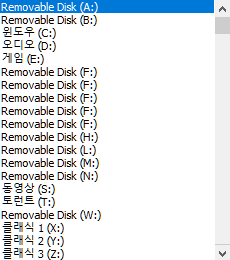 If I changed the drive letter of removable hdd, everything simply make another same data copy of the hdd. Re: identify multiple removable disks by its label. I've just formatted C: drive while newly installing Windows 10. I have 8 hard drives on my system and 7 additional hard disk using HDD docking station. After reinstalling OS, the drive letters of hard disks are messed up for some reason. So I should change it manually. There is no problem with built-in hard disks when changing its drive letters. However, as you may see the following screenshot from Everything options - Indexes - NTFS - Local NTFS Volumes of my own, everything makes a copy of the indexes of external HDDs using docking system. When I insert my HDDs one by one, operating system recognize it as a drive all "F" initially. In that reason, I have no choice but to reassign drive letters to recognize easily while searching with everything. Everything duplicates the HDD indexes of renaming its drive letter. everything makes a digital life easier! Thanks again and I made some donation with a thankful heart. I've changed the way Everything will handle volumes that have 'moved' for the next release of Everything. If everything has detected that a volume has been moved to a new drive letter, the old drive letter will always be removed. Hope to have a beta update soon.. When a hard disk is inserted into usb hdd docking station, the index seems to be added without enabling the option: "Automatically include new removable volumes". The docked hard disk seems like working as if it is fixed drive. Please confirm if it is an expected action. What kinds of device can be a removable volume for NTFS hard drive? When will the above option work? Windows treats external USB drives as fixed volumes and so does Everything. A removable drive would be a CD/DVD drive or floppy drive. i'm very interested in indexing about a dozen usb/removable drives but i don't know if Everything will do what's in the title ? ideally, i'd like if the disk labels were displayed instead of the drive letter for usb drives, is that possible? File lists might be the best way to do this. In Everything, from the Tools menu, click File list editor. Select your USB drive and click OK. Create a filename and click OK. File lists are csv files, you can change the root drive letter to anything you like with notepad. In Notepad, from the File menu, click Open. Select your file list and click OK. Replace E: with your custom label (eg: USB Photos:), where E: is the USB drive. thank you Void, i'm very interested in this feature but seems complicated, i understand the steps, just so many of them. may i make a suggestion, to greatly simplify this, i'm sure alot of ppl have offline storage as either backup or just storage (floppy? cd? dvd/bluray/thumbdrives, hdd even large flashdrives 128/256gb are coming can be used for storage). what if instead of just keeping the drive letter for all drives, why not the volume label too ? Then Everything would display it when a drive is offline. that could be an avenue. cheers my new friend, i wish i'd discovered Everything long ago ! You can do that too, keep the drive letters the same, except name your file list the same as your volume label. Show the File list filename column by right clicking your header column. This eliminates the second part of my post above about editing the file list with notepad. As for simplifying the rest I would probably have to add a file list wizard. thank you but actually, i meant instead of doing those steps with file list. here's what i mean: Everything scans any drive, you can add a line of code to save the disk label with each file and at a later time when we use Evt to do a search and a resulting hit is on an offline drive, then display the label instead of drive letter in the results. on the user part, it merely requires the activation of do not delete offline drives from database. in code it would mean adding an extra bit of info when you scan drives , just the label. then as results are displayed check if drive is online, if not show label. its a rather simple solution and doesn't need static file lists that could be quickly obsolete if we change something on the drive and forget to redo the list. i hope this is usefull to you, i'm open to discussing it more and even testing it for you. Thanks for the suggestion, some good ideas here.. I like the idea of automatically scanning all drives, and recording the drive label in the database. Added to my TODO list: Rescan the indexed folder of a offline drive when it is re-inserted and the last scheduled update was missed. Not much will change in Everything 1.4, I will definitely review this in Everything 1.5.
i was thinking, your idea to rescan the files (as mentioned in your post above mine here), it doesn't have to be automatic, but it could be manual, simply by right-clicking the drive in explorer we could add/refresh the drive into the database. Everything could also just ask us if we plan to keep this drive in the db for offline searching. Any idea on when this feature could be tested ? ps:also can we add/refresh via an ETP connection to a server over Lan ? void wrote: File lists might be the best way to do this. If we have got a large file 100 MB+, I'd better prefer not standard Notepad (which can hang down for some minutes), but the portable app EmEditor which is fast and can load huge files in a moment, uses low resources.